In addition, there are some things that have yet to go to seed: Detroit beets, radishes (Pink Beauty & China Rose), and Watham 29 broccoli in the fall garden, plus the Fordhook Swiss chard I planted in the spring. The rutabagas and parsnips I planted aren't up yet, so we'll have to see about those. Some of these are biennials, so I'll have to wait until their second year to get seed. And hopefully, I'll manage to collect from seed from the sweet basil seed heads I gathered. I didn't bother with seeds from the other herbs because they are perennials. Mangels - for feed, may still get these in. Mine is a modest list, but one I'm pleased with. Last year I saved only 8 types of seeds, so this is a huge expansion for me, 26. 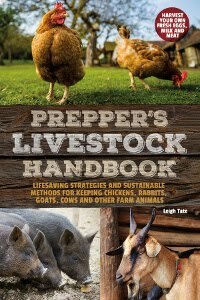 I don't know if that last paragraph qualifies as a bona-fide soapbox (of which I don't mount many on this blog), but, these are my concerns and a strong motivator for me in regards to having a self-sustaining homestead. In terms of reaching my goal, I figure it will be several years before I can fulfill it, as I'm still experimenting with vegetable varieties and adding new crops. One thing I'm realizing about sustainable gardening, is that seed saving means more that a simple gather and plant cycle. It also means preparing for failures, either crop or seed. For example, this year I barely managed to harvest enough tomatoes for the amount of pasta sauce I needed, because I had disease problems. At first, I wasn't sure I wanted to save those seeds. When my plants made a comeback, I planned to save some of that seed, but only managed the Romas. To prepare for a recurrence of something like this in the future, I need to be saving more than a year's worth of each kind of seed. I need my own personal seed bank, if you will. There are a lot of books written on the subject of seed saving, and I do have a gist of the basics, which include storage conditions and seed viability. For me, it will also mean good organization. 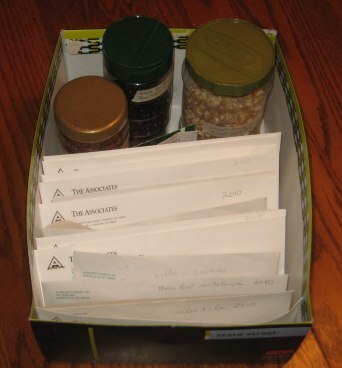 I store my saved seeds in recycled envelopes, placed in alphabetical order in an old shoe box. 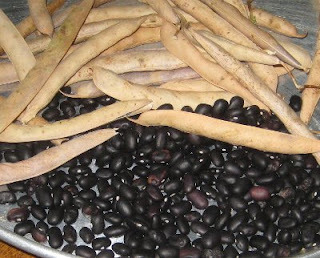 Seed of larger quantity (corn and beans) are kept in recycled jars). I store that box in the refrigerator during the heat of summer. Last year I wrote the type and variety of seed, year gathered, and planting dates on each envelope. This year I will add an expiration date based on that particular seeds viability. Unfortunately, seed viability isn't an exact science, and depends on a number of factors. That's why there is so much variance in the viability charts. Keeping the seeds dry and cool is the most important factor. This is one I doubt I've fulfilled very well, considering that we didn't have AC last summer with it's soaring temps and humidity. When in doubt, I can test viability before planting. Lastly, some links to viability charts. As mentioned, you will notice they aren't the same. But at least they give us a gist of what to expect in our seed saving under ideal storage techniques. It's okay about the soapbox. I'd join you up there about the GMO engineering of our food supply. That's quite the list of seeds saved! Way to go. I have only saved tomatoes and let a few things self seed in the garden - lettuce, salad greens, dill. I'd be up there as well on that GMO soapbox. It is scary stuff and I wish more people were aware of what is happening to the food supply. I collected some seeds and will hope for the best, but as this is just a hobby I expect to have to buy more seeds and maybe even plants next year. I did cover the garden in leaves in an attempt to improve the soil...we'll see how that goes next spring. The whole GMO thing is a horror story that many people don't even seem to care about . . . and probably won't until it's too late. My biggest problem with seed saving is that our short season doesn't allow enough time for many crops to even produce seeds. I have lots of work to do on this. I think you're doing wonderfully and your list of saved seeds is very impressive. Preach it sister! I totally agree on the GMO front. Great job on the seeds saved. Great job with your seeds Leigh. I'm impressed as usual. Way to go. I really didn't get much of any seeds saved this year. Our weather wasn't conducive to ripening of plants, so there were few seeds at all. The tomatoes got nasty blight and we had powdery mildew on the pumpkins and something hit the cuks. I wasn't going to save those seeds anyway. I did harvest enough garlic to replant this fall. Considering it cost me $14 for 2 lbs of seed garlic last year, I figure that was a decent savings. Evelyn, you can join us too. I'm glad you mentioned self-seeding. My dill did the same thing and I got spring turnips the same way. I'm pretty happy to let any volunteers that want, present themselves and thrive. Renee, good for you to mulch your garden with leaves for the winter. Leaves make forest soil fertile, and I think they help in the garden too. That's why I like to use them for mulch. I hope your saved seeds do well! Mama Pea, yes, you northern gardeners really do have a challenge in this area. I wonder how the northern seed companies manage? We have the reverse problem of too much heat, which can wipe out a crop too. I'll be interested in what you learn about it. Heather, thanks! I only wish our government would join the non-GMO bandwagon, instead of trying to force them down our throats. Grassroots momentum is picking up however. Thank you Vicki, you're an encouragement! Nina, you mention some of the things I've been thinking about in regard to seed saving, weather and disease. 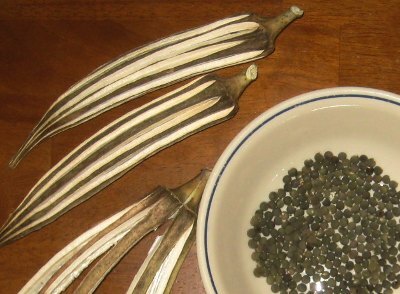 These are common problems for seed savers. The only way I know to address them is by keeping several years worth of seed. I need to follow your lead on garlic planting. I only bought one seed bulb, which made at least a dozen new bulbs, all of which I replanted. That's a slow way to increase our garlic crop and we do use a lot of garlic. Wow, that's a lot of seeds! It is a good idea to save more than one year's worth of seed, and to keep some held back, just in case. I've had disease problems with my tomatoes the last few years, so I am going to dump the tomato seeds I've saved recently, and grow out some older seeds, from a time before the problems started. It's always better to have too much than too little! Jo, I'm amazed at how many folks have had tomato disease problems recently. I hope you'll blog about your tomato seed and the results because I am really curious whether the different seed will make a difference. I love that you are working towards saving so many of your own seeds, we are too. 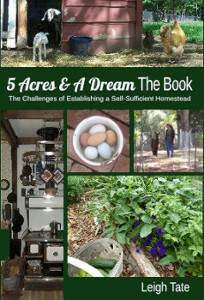 I am reading a book called "The Resilient Gardener: Food Production and Self-Reliance in Uncertain Times" by Carol Deppe that you might find interesting if you ever get a chance to pick up a copy. She talks a lot about seed saving in general and also has another fascinating book called "Breed Your Own Vegetable Varieties: The Gardener's & Farmer's Guide to Plant Breeding & Seed Saving"....they are both good books. Mr. H, thank you for the book recommendations. Our county library has the 2nd one, but not the 1st you mention. It sounds like the more useful (for me) of the two, so I will be on the lookout for it as well. I'll request the one they do have anyway! I don't feel like I can ever learn enough on this topic. It is great to see the variety of what you collected and it is not easy to do the different types that you did. Your on your way to being a true seed collector, yeah. Thank you Preston! And thank you for visiting my blog and taking time to comment. When is your magazine site going to functional? 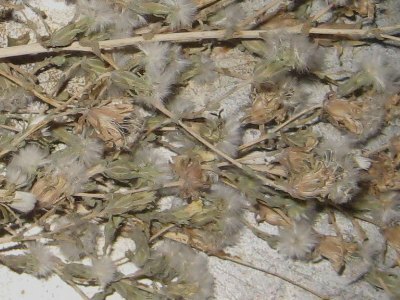 As I have one of the shortest seasons, it is a challenge to save seeds. BTW I made the meatballs. I posted an update. They turned out well. and I finally had some time to come on over to visit you. Lo and behold I have been posting about seed saving too! You go girl. I think it is so fun and easy to save at least a few seeds each year. Your blog is excellent- really well done. I love how you link so many resources. I look forward to reading and catching up this winter! Upinak, I'll say you have a challenge saving seed. I love your gumption though. I'm on my way to get that meatball recipe! Phoebe, I appreciate the return visit, and your kind words. They are very encouraging to me. I'm on my way to read your seed saving post. I love sharing information across the internet.